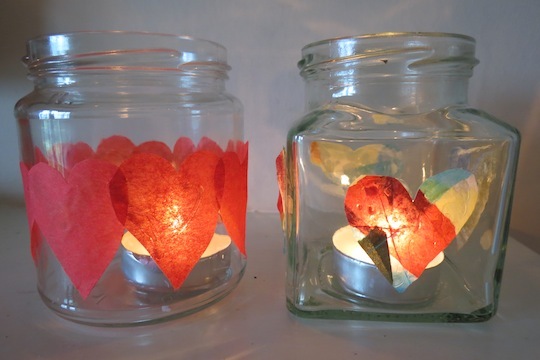 This is one of our valentine day crafts for kids that is quick, easy and lots of fun. The votives also make great ornaments for the table. We love them! 1. 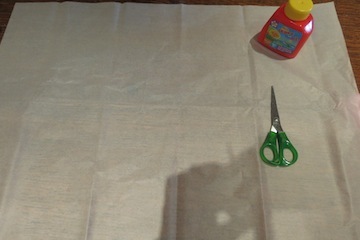 Clear an area of table and lay out a sheet of white tissue paper. 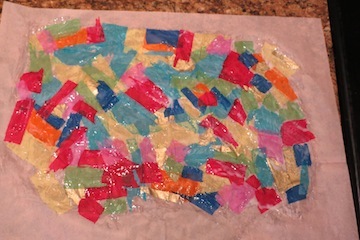 Cover half of the sheet in PVA glue using a paint brush. 2. 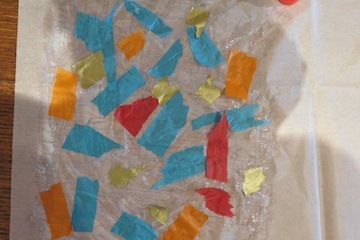 Take a variety of different coloured tissue paper and rip them into small strips. Stick them to the glue-covered tissue. Cover the page, overlapping the strips so you get a really colourful effect. 3. Cover all the strips of ripped tissue in a thin amount of glue and leave it to dry. This might take 30 minutes or so. 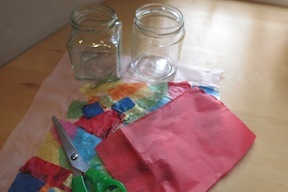 The glue dries clear to create a sheet of "stained-glass" effect paper. 4. 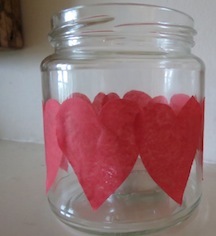 While you wait for your stain-glass effect paper to dry, take a sheet of red or pink tissue and cut out 5-6 medium size hearts. When dry do the same with your stained-glass paper. 5. 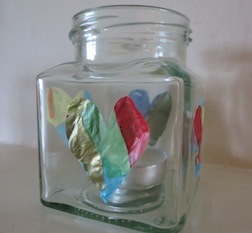 Stick your hearts around the jar with PVA glue. You can space them out or stick them close together.Why not make a number of votives for the table or across the fireplace? Finally, place a tea-light in the bottom of each lantern and light (adults only).